The term “thrivers” refers to patients who are transitioning out of a concentrated plan of care, into a long-term mode of wellness – care plans that are often arduous, daunting, and life-altering. These patients are striving to enter “thriver mode” – a place where they can flourish. Those seeking to thrive will settle for nothing less than empowerment. Similar to most patients, thrivers have an underlying set of motivational factors, however, theirs stem from a common thread: fear. Even after completing their initial care plan, studies indicate that thrivers often feel unguided, discouraged, and fearful. This sense of fear can be associated with a decreased quality of life, including fatigue, lowered sense of well-being, occasional sleep disturbances, and occasional anxiety* to name a few. However, they also have a deepened appreciation for the sanctity of their lives, and their bodies, and will often demonstrate a tenacious adherence to diet, exercise, and supplement recommendations— hence their quest to continue to seek professional guidance. But it’s not just patients recognizing this need. Many clinics have begun to incorporate a thriver transition plan as a standard component of care as well. This is a positive trend for thrivers because integrative practitioners are ideally suited to lead, and advise throughout that next level of care. Are thrivers on your radar? If not, they should be. Integrative practitioners are ideally suited to meet the needs of this population and fill in the medical gaps that presently exist. At this stage, patients require a high degree of individualized attention, and approaches that address physical, psychological, spiritual and nutritional wellness. This transition is a partnership between the patient, their initial care provider, and their long-term wellness integrative advisor. It is important to develop this partnership early, and to work together with their initial plan of care physician to transition the patient smoothly and help reduce their fear. Transitioning into thriver-mode is one of the most profound transformations a patient will experience. 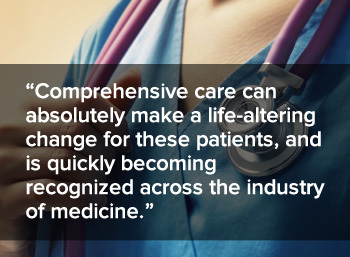 Comprehensive care can absolutely make a life-altering change for these patients, and is quickly becoming recognized across the industry of medicine. Integrative practitioners are encouraged to proactively create these partnerships, build connections with initial care providers, and help transition these motivated patients to thriver mode.